Lots of chat from fellow science bloggers (see here, here, here and here) about fluoridation following the recent Hamilton City Council decision. Naturally most of the posts focus on the science and the logic (or otherwise) of the arguments around fluoridation. I have no knowledge about fluoridation per se and have nothing to add to the science. What I did think was necessary was to posit an equation which gives the debate and many others like it (folic acid, vaccinations etc etc etc) a wider context. 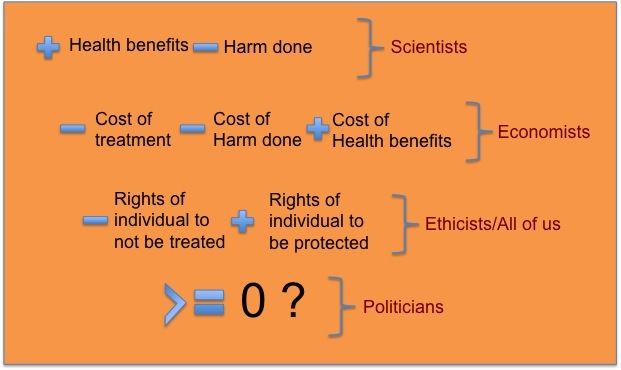 My simplistic equation points out that any decision on a public health intervention involves far more than scientists and far more than science. Obviously, financial costs ranging from what it may cost to provide an intervention, to the impact of less ongoing health associated costs and greater productivity in those benefiting from the intervention are an essential part of the decision making. I would love a health economist to weigh in and give us a better idea of what an equation may look like. Questions of rights and responsibilities are harder to quantify, but no less important than the scientific and economic ones. Indeed, I think they are the most important as how we deal with them defines who we are as a society. In the case of folic acid, for example, this means balancing the rights of the unborn child against the rights of the mother and of the rest of society. While not a complete parallel to the abortion debate, it is familiar territory. At its heart is how society cares for the most vulnerable, whilst also acknowledging the rights of others to make choices for themselves. The final part of the equation involves the decision makers, spare some sympathy for the politicians here as they grapple with the complexities of science, economics and ethics. This year is local body election year, and next year we have a general election. My challenge is that if you care enough about these issues to read a blog post, spend a little more time getting to know the candidates and try to figure out if they are up to making complex decisions on your behalf. If so, give them your vote. I think the health boards have done the cost benefit analysis and are satisfied that fluoridation pays. However, I agree the key issue is the ethical, political, values judgement. Whatever the science or economics say the people must really accept or reject a policy. There should not be any imposition on an unwilling public. Unfortunately this is what the Hamilton City Council has done. Despite a binding referendum in 2006 (70% supported fluoridation) and recent polls by the city council (a large majority still supported fluoridation in both polls) they went ahead and decided to stop – basically because of pressure from an anti-science activist group. They should ethically have held another referendum at the next elections if they were convinced anything had changed in the last few years. Hamiltonians are entitled to be pissed off. Well, OK, but that depends on having a well informed population, and having mechanisms to prevent undue influence by special interest groups. The City of Fairbanks, Alaska, took an interesting approach to this issue (which may well not be unusual). they did a big review of fluoridation risks and benefits, including consideration of ethical issues. They concluded that there was no evidence of any harmful effects associated with fluoridation, but the benefits were fairly small. And then because it was costing money and the people were not very keen on it, they decided to remove fluoridation treatment. BUT – they made it extremely clear that they were then devolving the responsibility for an adequate fluoride intake back onto individuals, and launched a big campaign to make the change in policy and its implications for personal responsibiity clear. There is also a societal context at work – ie to what extent is there an ethos of personal responsibility (and financial responsibility) for an individual’s health? This is rather different in the USA to here, so I believe.